We had less than 24 hours in Paris, in fact just an afternoon before we get back on our journey. So c’mon then. Let’s get going. We walked along rue Faubourg St.Honore and looked into shop windows – till we reached Hermes. This was so Mummy could buy herself a “birthday present” – which was a pocket kerchief for me! 🙂 Why? 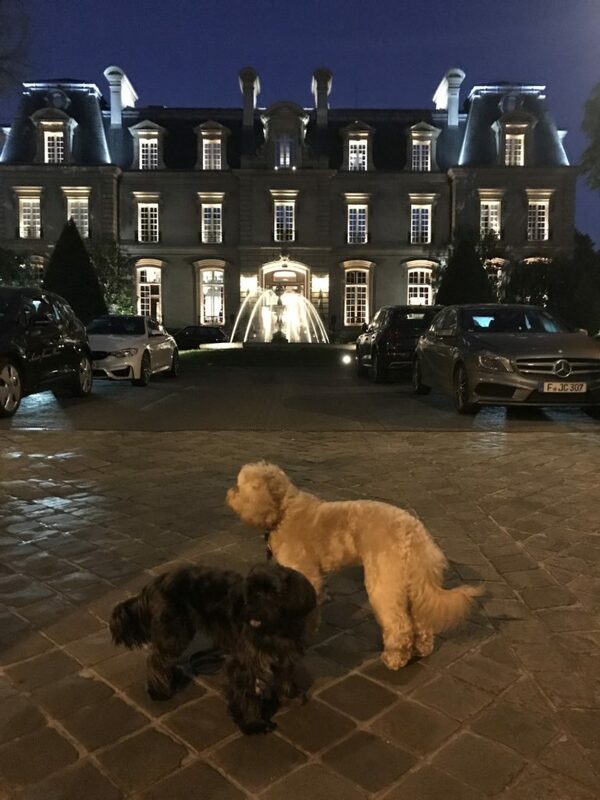 Because it made her happy that her pooches are “well-dressed.” By late afternoon, Paris was steaming at 28 degrees. We were panting all the way. 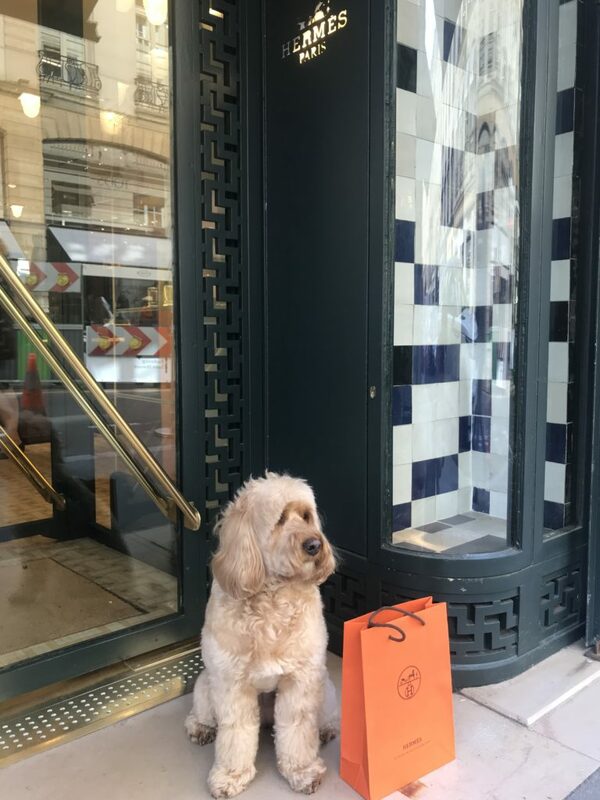 Mummy wanted to stop for a cup of the and some patisserie so we could cool down, but we were not allowed in. Note: not all eating places are dog-friendly. You do have to ask. It was way too hot for us so Mummy decided we should go back to the hotel to rest. Enroute, there was one stop for that obligatory photo. I’ve done this pose quite a few times but this will be George’s first. Mummy made sure we each had our Hermes kerchiefs on! LOL! So glad to get back to the hotel for some relaxation time. We’ve been up early and travelling all day. Before long, it was time for dinner at the hotel. 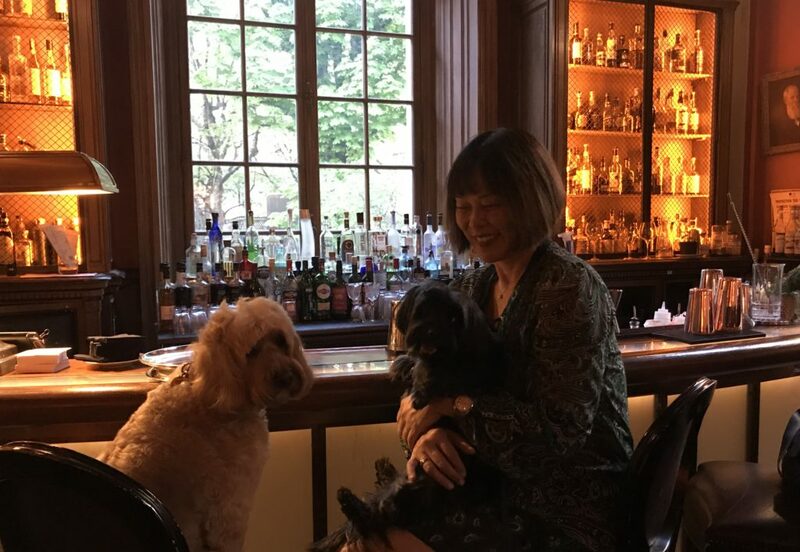 But first, cocktails at the bar. What a lovely room – it used to be the Thiers Library Foundation – thus all the book shelves. 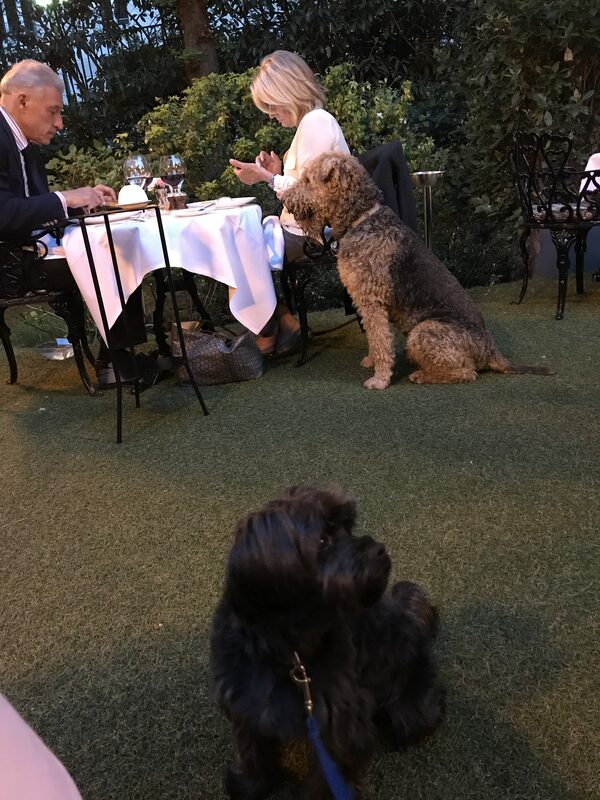 As it was such a lovely evening, they moved the dining to the garden … and we weren’t the only pooches dining there. 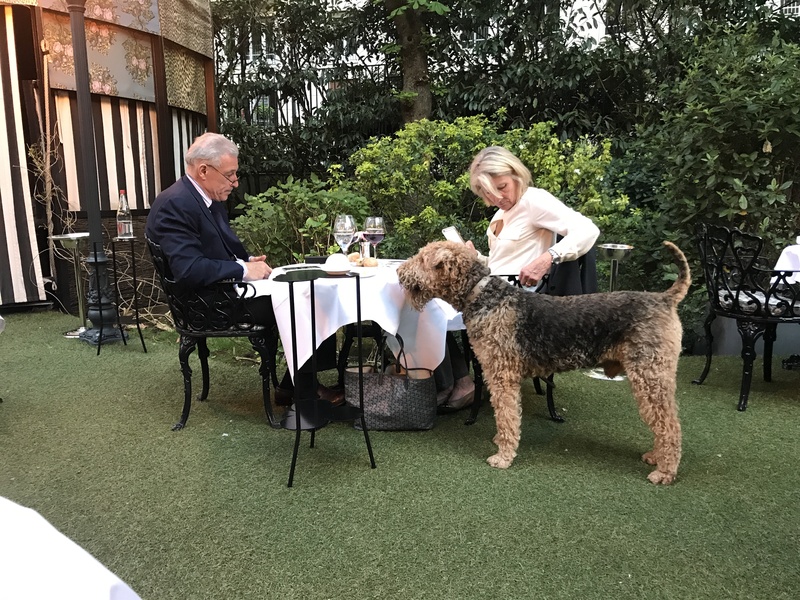 Next to our table was an Airedale Terrier – who wasn’t in the least interested in us. He was focused on the food. And along came a Lhasa Apso – now we understand why George is often mistaken for one. We all got along until we heard a dog barking outside and I responded enthusiastically and George barked along because I barked. Mummy was horrified but every one else laughed. Sorry! 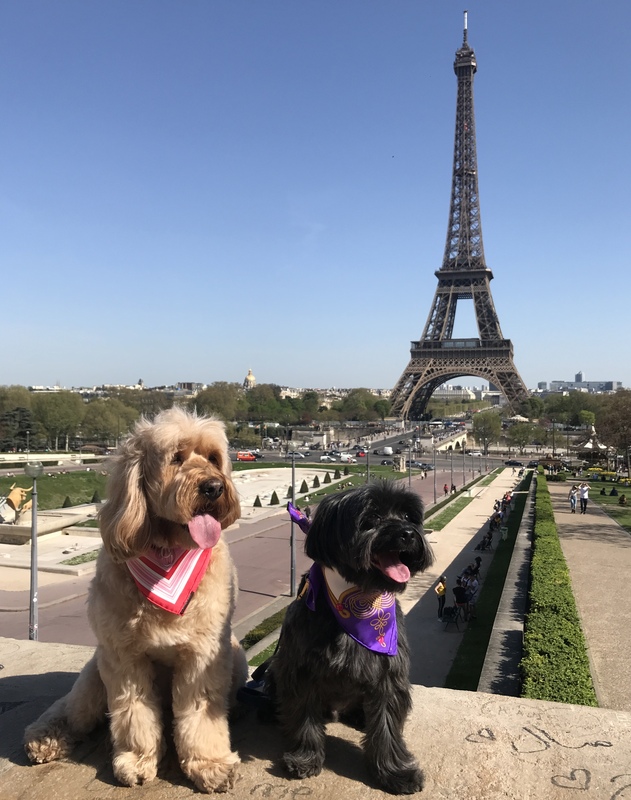 Couldn’t help it – besides it was a bark in French and I wanted to tell the Frenchy, the Brits were there. Well, that was a lovely evening. We went for our last walk It’s a lovely building, isn’t it? This building with neo-classical facade right in the middle of Paris. Mummy was glad we stopped over after all. May’s comment: I thought we could run around and visit all my favourite places in an afternoon but alas not. 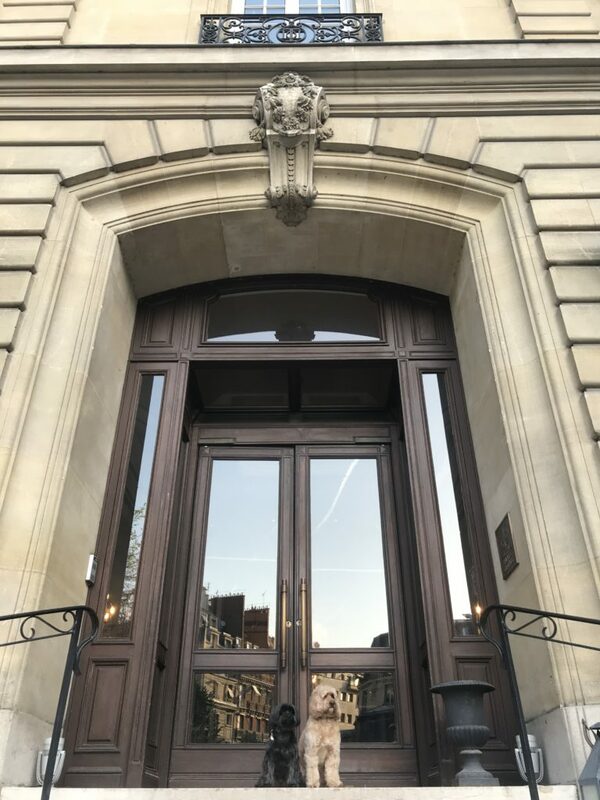 As we walked the streets, so many memories of the days past when I had spent a lot of time there, doing up an apartment and living the life of a “Parisian”. But there wasn’t enough time and the weather played a big part in making it difficult to walk around with the dogs. I’ve forgotten how magical Paris can be – especially in the sunshine. I guess we really should come back and do a few days here and to see friends. It was also a good reminder about dog-friendliness or not in Paris. 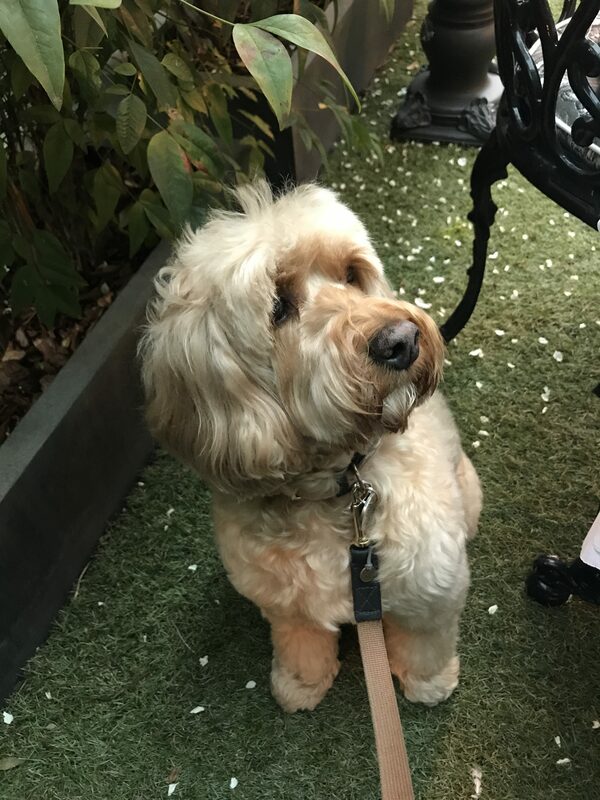 It is not a given that all eating places allow dogs. 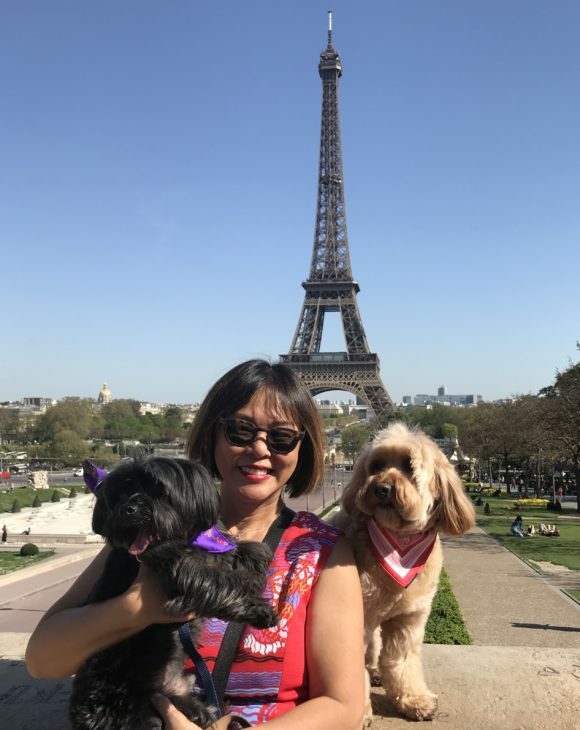 We were walking along rue du Faubourg – and wanted to stop for a cup of tea and some patisserie at Joel Robuchon but was told we couldn’t go in – they had a water bowl outside for the dogs. Not a good idea. On the other hand, we were allowed to dine at the hotel’s Michelin-starred restaurant. And we weren’t the only dogs there. Travel by taxi – 80% of the time they don’t take dogs. Very frustrating especially when you’re in a queue at the train station and kept getting refused but we have now a number for G7 Taxi. We can call and within 7 minutes, there’s a taxi that will take dogs. Dogs on leashes can go in the Metro and on buses. 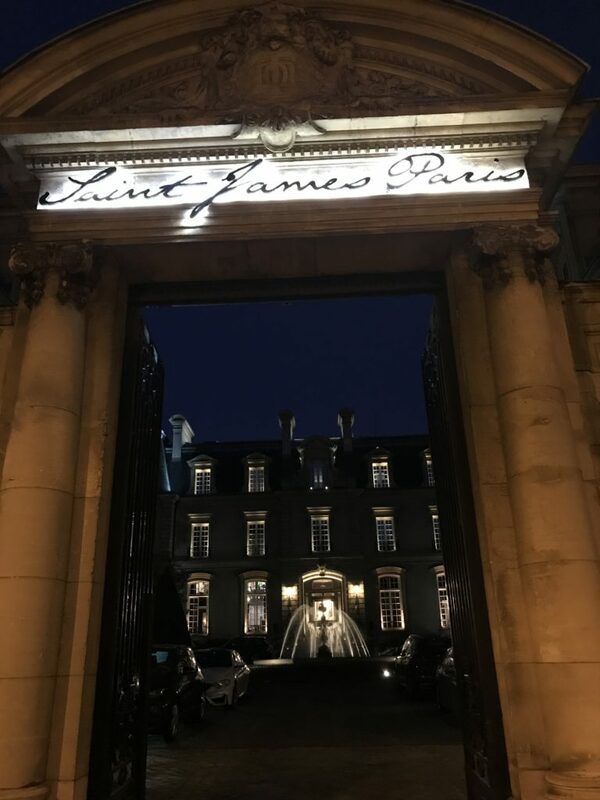 St. James Paris is part of the St James Private club in London. They love dogs! 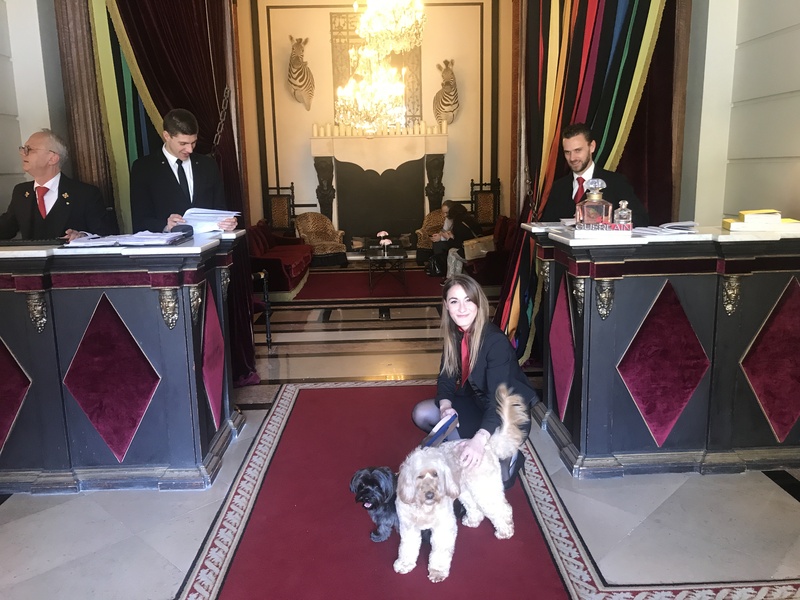 and they charge 35 Euros – per dog. I did challenged them on what the cost was for and told them it doesn’t take more to clean after one or two dogs. Besides my dogs are probably less messy than most toddlers and children. 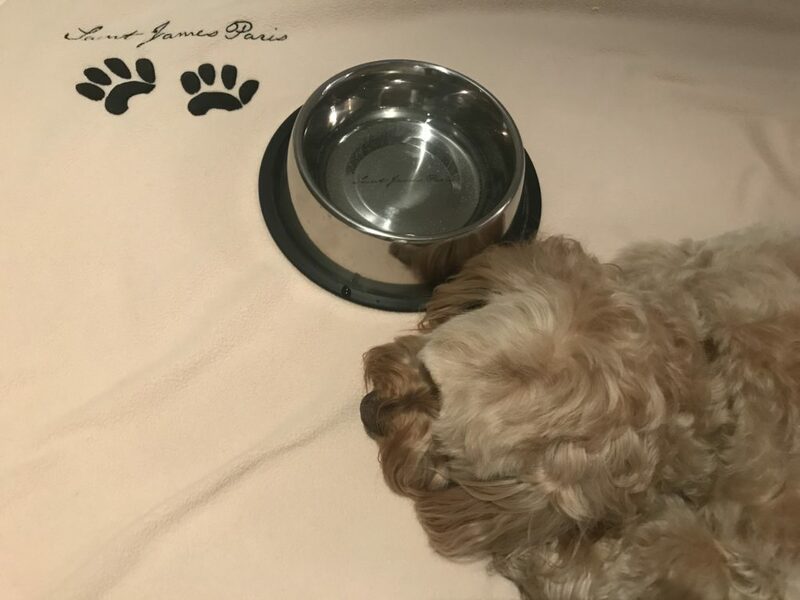 Their dog amenities – which was all one blanket and one dog bowl! They waived the charge for the second dog. This is not the first time. I’ve questioned this before at other hotels and always the same result. One price for deep cleaning the room when dogs are involved. It’s fair but not per dog. It’s also located in a green part of Paris and made it easier to walk them around. 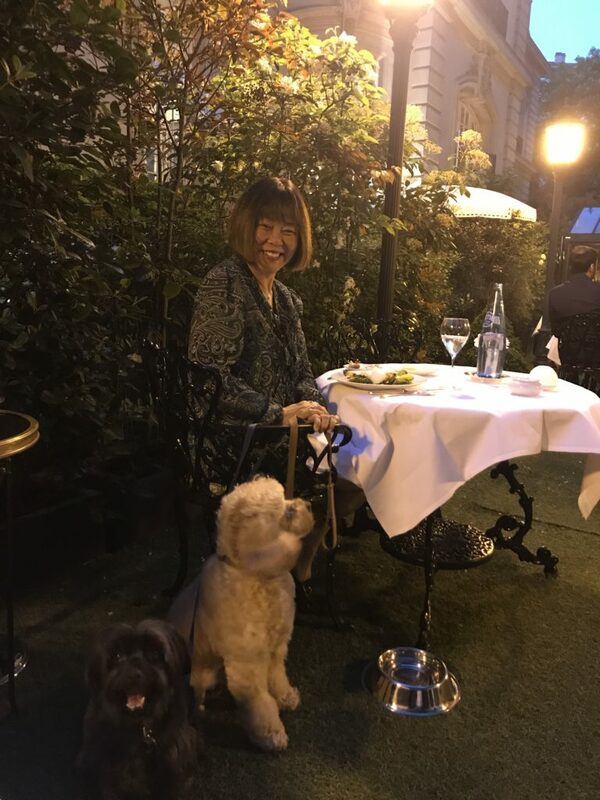 Hotel Costes – my favourite place. Though the rooms are crammed, I love the atmosphere and the location. And we can absolutely dine in their trendy and hip courtyard restaurant. Westin Hotel – more for convenience, but being one of the large American chains, they are more cautious than others. Dogs are definitely now allowed in the F&B areas. And they must not be left unsupervised in the rooms. Le Roch – looks interesting. Must check this out on our next trip. Your blog is truly wonderful! We are currently sitting having dinner in Locanda Locatelli due to your blog. 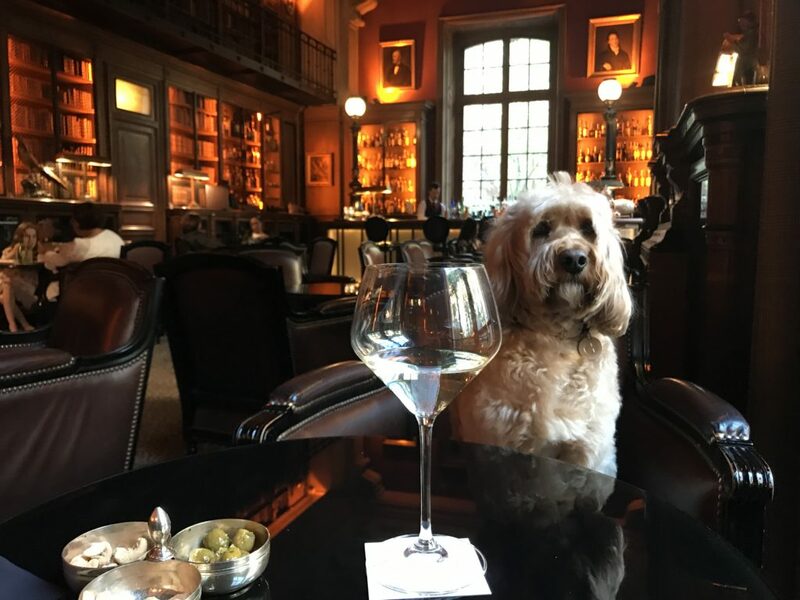 I have been here before but only knew it was dog friendly because of you. 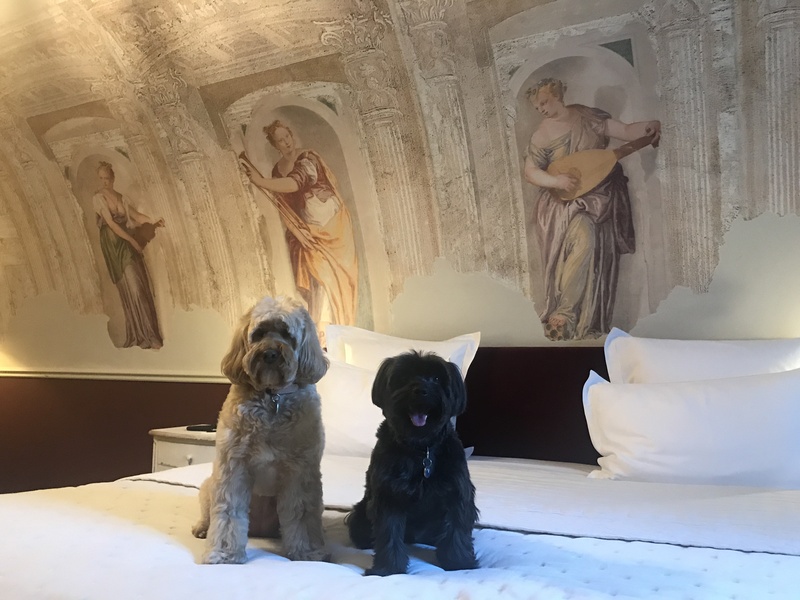 We have taken digby to Paris before and stayed in the lacroix hotel which is dog friendly but so basic but we shall try again at St James in the future. We have also been to the basque restaurant in Marylebone because of your blog. So please, despite the odd escape, know that dog owners all over London are having a better life because of you. Sorry you didn’t get to visit all your stops May.